Zoëtry Paraiso de la Bonita has joined the Mesoamerican Tourism Reef Initiative (MARTI) to help protect the beautiful and unique flora and fauna in the area surrounding the Northern Hemisphere’s largest coral reef. The initiative unites tourism service providers such as hotels, tourism developers, tour companies and cruise lines with civil and governmental organizations to develop and implement initiatives in favor of the environment in general and the area surrounding the Mesoamerican Reef in particular. Created by the Conservation International Coral Reef Alliance and the local environmental organization Amigos de Sian Ka’an in conjunction with the Riviera Maya Hotel Association, the initiative aims to promote environmental best practices, further the responsible use of natural resources and foster a culture of environmental sustainability among business owners, hotel operators and even guests. The alliance is the only one of its kind in the area surrounding the Mesoamerican Reef. Members of the alliance, including Zoëtry Paraiso de la Bonita, completed several actions, including signing a letter of commitment, allowing MARTI authorities to assess their level of environmental sustainability (including recycling programs, solid waste and wastewater management, energy and water-saving initiatives, etc.) and create a “green team” to make sure recommended environmental initiatives are implemented, draft an environmental action plan and policy handbook, and train personnel in environmental awareness. 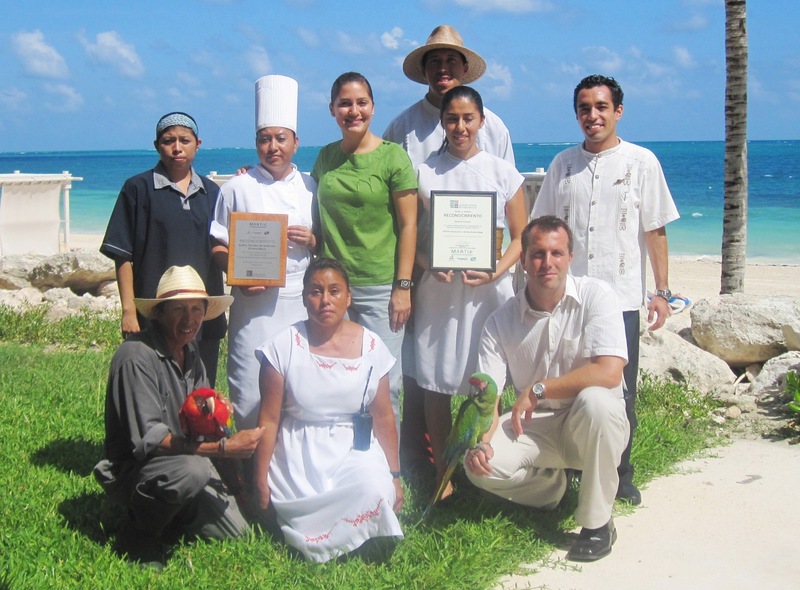 While not a formal certification program, MARTI bases its norms and best practices on such international environmental certification programs as Green Globe and ISO 14000, said Adriana Del Angel of the Riviera Maya Hotel Association, who heads up the initiative’s hotel sustainability project. This entry was posted in Zoëtry Paraiso de la Bonita and tagged Sustainability. Bookmark the permalink.